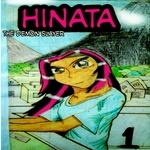 Still working on HINATA: The Demon Slayer. That's all you need to know. Mai Lee is a fifteen year old princess who has a cray-dog named Javelin, who's thoughts she's able to hear. She has a crush on a boy who lives in the same kingdom as her, and, to her surprise, she finds out that he likes her as well and so the two start a relationship with each other. But as they begin dating a servant of hers has his eye on her as well and goes to extreme length to win her over. But the question is, who will she end up choosing? Her childhood crush, her servant,or perhaps neither. Her dog may be her only true friend. This story I came up with my brother, so he's sort of the author too. Demons, witches, spirits, zombies, vampires, werewolves, and wicked powers. 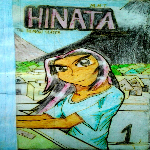 These things exist in the world of fourteen year old, Hinata Tlaltelpa.She just so happens to be a werewolf herself. And one of the last one's at that. Because of her heritage, she's rejected by most people at least until something happens that changes her life forever. This material is not to be reproduced, copied, or transmitted in any way without permission from the author. All characters and events in this story are entirely fictional and are made from the author's imagination. "To see this comic in full color, go to my profile and click on the next comic"